Valeant cut its forward guidance as revenues fell short of expectations. Valeant Pharmaceuticals International Inc disappointed investors again on Tuesday falling short of its first quarter earnings expectations forcing the company to slash their projected financial results for the year. The company’s stocks leaned heavily on the “sell” side in early trading sending shares down more than 18 percent. Early morning trading saw the stock fall by 15 percent in New York and 14 percent in Toronto. The Quebec-based company overhauled most of the members of its board of directors and replaced its chief executives as government authorities in the U.S. are launching a range of investigations against the company. It currently expects revenues between $9.9 billion and $10.1 billion down from an $11-billion forecast as well as an adjusted earnings per share of $7 down from the $8.50 to $9.50 forecast earlier. The company’s earnings reports also disappointed investors as it fell short of analysts’ expectations of $2.38 billion with an adjusted EPS of $1.36 as they posted results of $2.37 billion and $1.27 adjusted EPS and a GAAP loss of $1.08 per share. Valeant admitted several shortcomings in operations as they grapple with “significant challenges” in its dermatology division’s profits and “speed bumps” in its distribution program with Walgreens in its presentation to investors. Growth in sales from Salix also fell short of original expectations. Revenue projections for the year will be cut by $800 million due to reductions in expectations from the U.S. dermatology business and the bowel syndrome treatment Xifaxan. The treatment generated $208 million in revenue, far below the projected $1 billion, after a rival company launched a similar product this year. Executives reassured investors that it paid back over $700 million during the year from its $30 billion debt which funded the company’s acquisitions. The company expects to remain on track with its payments this year. “We have a solid position with our liquidity,” according to CEO Joseph Papa. 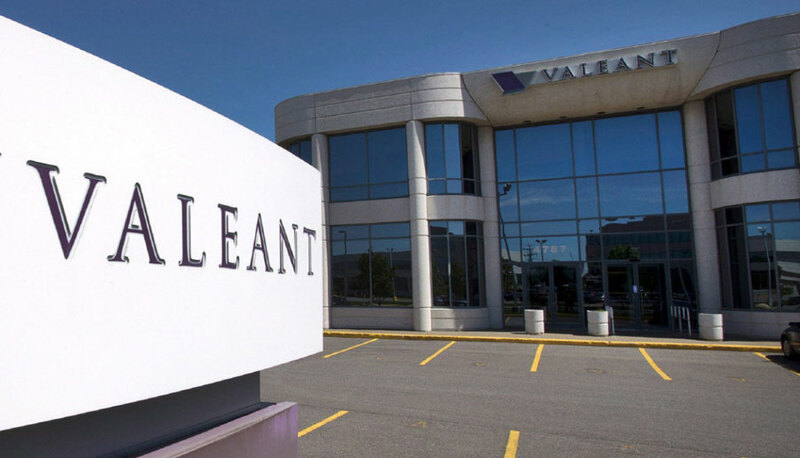 Valeant had briefly been Canada’s most valuable publicly traded company with shares above $260 in the previous summer, but the past 10 months has been harsh on investors. The company has been growing through various acquisitions and has been publicly rebuffed for its hostile takeover attempts, including the 2014 attempt of Botox maker Allergan Inc.
Former CEO Michael Pearson pushed the company to take actions to increase shareholder value as his compensation relied heavily on giving returns of at least 15 percent. He cut funding on research and development from the acquired companies while increasing the prices of newly acquired drugs overnight. The company also took advantage of the ultra-low tax rate from a reverse takeover of Biovali Corp in Canada. The company’s growth ground to a halt when Democratic presidential candidate Hillary Clinton said that she will pursue the company for its unfair price hikes which quickly affected the company’s shares, falling even further as shortsellers and journalists discovered serious deficiencies with an affiliated mail order pharmacy. This forced the company to replace Pearson with former CEO of rival Perrigo Co., Papa.